Doug Neary is Chairman of the firm and serves as a Partner in the firm’s Corporate and Capital Markets group. His practice has focused for decades on M&A, corporate governance, capital raising, public disclosure, corporate finance and compliance for a stable of public and private companies and financial sponsors and lenders. Doug advises clients on mergers, acquisitions and divestitures; corporate governance, SEC, capital formation (including private and public offerings); NYSE and NASDAQ listing requirements; corporate finance; venture capital; and general corporate matters. He is knowledgeable on general contracting issues, commercial transactions, joint ventures and strategic alliances, and provides counsel with respect to organizational and structuring matters for corporate clients. As Chairman, Doug helps to manage and support many of the Firm’s most significant clients. He helps to oversee major projects so as to ensure that all appropriate resources are dedicated to addressing the client’s needs and to provide clear communication and reporting. He also helps lead the Firm’s efforts in developing new and expanded client relationships. Much of Doug’s more than 30 years of experience has been focused around clients buying and selling privately held and publicly traded companies, working closely with the private equity and investment banking community in those endeavors. In addition to his experience with hundreds of business transactions, Doug helps clients with public disclosures, securities filings, and Securities Act and Exchange Act compliance work. Quite frequently, Doug counsels clients on corporate governance matters, as well as Sarbanes-Oxley Act and listing standards issues. He handles equity and debt private placements, including the necessary securities law compliance. He also is active with private equity transactions and helps clients in negotiating and consummating venture capital financings. Doug has represented numerous private equity, venture capital and mezzanine financing sources in making their investments, dealing regularly with issues of valuation, governance, management and exit strategies. Having served as corporate secretary of Invacare Corporation (NYSE), Doug also is on the board of directors or serves as secretary of several privately held corporations and foundations in the Greater Cleveland area. For many years, Doug has served as the Ohio Co-Chair of the KPMG Audit Committee Institute focusing on topical matters of interest to public company directors and officers. A frequent lecturer at corporate and securities law seminars, Doug is also a member of the American, Ohio and Cleveland Bar Associations, having served on the Corporate and Securities Law Sections. 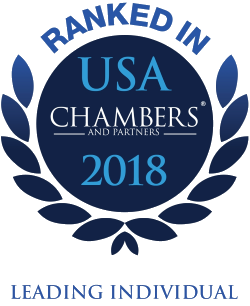 For the last six years, Doug has been recognized for his work in Corporate/M&A by Chambers USA: America’s Leading Lawyers for Business, an industry-leading legal resource for professionals in search of qualified, experienced legal counsel. In 2018, Chambers USA researchers reported that Doug is regarded as an "excellent negotiator and strategist" by clients, who commend his "very pragmatic" counsel and his "superlative client service." He has a wide-ranging transactional and governance practice, earning particular praise for his abilities in securities work. He also has been selected for inclusion in The Best Lawyers in America© (2010-2019) in the areas of Corporate and Compliance Law, Corporate Governance Law, Corporate Law, Mergers and Acquisitions Law and Securities/Capital Markets Law for Cleveland. He was just recognized as 2019 “Lawyer of the Year” in Corporate Law and already received back-to-back designations as Corporate Governance “Lawyer of the Year” for 2015 and 2014 in Best Lawyers. Doug has been selected to the Ohio Super Lawyers list from 2007-2019. He is AV rated by Martindale Hubbell. For more than a decade, Calfee's Corporate and Capital Markets group has been ranked by Chambers USA as one of the top groups in Ohio. In 2018, Chambers USA researchers praised Calfee's Corporate and Capital Markets group for “its high level of knowledge and sophistication,” and as “an impressive team with a strong track record across a broad range of corporate and transactional matters." In prior Chambers USA guides, researchers have published the following about the group: “Very efficient, practical and business-oriented in their approach,” and “We would not have the success we have had without them being side by side.” Calfee clients also were asked about Doug himself. He is characterized by clients as "one of the leading practitioners in Cleveland" who is "very thoughtful and a good sounding board, so you can discuss a variety of corporate issues with him and gain a better insight and appreciation of the issues by the end." Doug was recently elected as Chairman of the Board of the Greater Cleveland Sports Commission, having served for many years on the Executive Committee and as Chairman of the Governance/Nominating Committee. He also has been a multi-year Team Captain for the United Way Campaigns, was a long-time board and executive committee member of United Cerebral Palsy, and on the junior board of the American Cancer Society’s Cuyahoga County Unit. Doug joined Calfee in 1985 and became a partner in 1993. He has served as a member of the firm’s Executive Committee since 2002 and as a member of the Management Committee since 2009. Doug was elected as Vice Chairman of the firm in 2017 and as Chairman in 2019. Invacare Corporation (NYSE: IVC), the $1.8 billion leading manufacturer of durable medical equipment. Oversaw Invacare’s approximately $227 million acquisition of Domus GmbH (a German holding company and three operating companies); the $132 million acquisition of a Massachusetts-based public company via a merger agreement with intervening tender offer to accelerate closing; acquiring dozens of smaller, privately-held companies representing important product line acquisitions or geographic expansions; numerous selective divestitures of non-core operations, including the recent $150 million sale of Invacare Supply Group (where the buyer was in the process of being sold to a Fortune 100 competitor). Ferro Corporation (NYSE: FOE), a $2.4 billion leading global supplier of technology-based materials for manufacturers. Oversaw the auction process and ultimate sale of the assets of the fine chemicals business (division) for $60 million in cash to a private equity buyer. Assisted Ferro in the purchase of a grinding and fabrication fluids business for brittle materials from a private equity seller. Assisted in the sale of a product line and manufacturing location out of the industrial ceramics business of Ferro. Park-Ohio Holdings (NASDAQ: PKOH), an industrial supply chain logistics and diversified manufacturing business. Led the acquisition of all of the capital stock of NABS, Inc., a premier international supply chain manager of production components, for $21 million from the founding family. Assisted Park-Ohio with the purchase of significant forging-related assets from Amcast Industrial Corporation and in establishing a joint venture and long-term supply arrangement with a strategic foreign industrial partner. Cornerstone Industrial Group, private equity fund. Acted as lead counsel to this private equity fund in connection with its buy-out and financing for the acquisition of a Wisconsin-based custom machine parts manufacturer and for the acquisition of an Ohio-based, high-quality refractory product manufacturer. PNC Erieview Capital (formerly National City Equity Partners), one of the top ten bank-owned private equity and mezzanine finance groups with over $1 billion in capital under management. Have assisted this client in dozens of equity and mezzanine financing transactions for leveraged buy-outs by various high-performing private equity sponsor groups. Associated work for PNC Erieview includes initial capital structure and investment work, recapitalizations, refinancings, amendments and waivers and various exit strategies and arrangements. American Greetings Corporation, a $1.7 billion leading manufacturer and retailer of innovative social expression products. Helped oversee American Greetings’ strategic alliance with Amscan, Inc., a manufacturer and distributor of party goods. The transaction entailed American Greetings selling various assets to Amscan and entering into a long-term sourcing arrangement and also a related warrant agreement. Assisted American Greetings with the acquisition of the on-line assets of the WebShots brand (one of the largest on-line photo and video-sharing sites on the Internet) from CNET Networks, Inc. (NASDAQ: CNET) for a purchase price of approximately $45 million. Assisted with the intellectual property and integration work for a related company acquired by American Greetings, Photo Works, Inc. Helped oversee the sale by American Greetings of its candle product lines to Lighthouse Candles, LLC. Bridge Industries, LLC, Ohio-based private equity firm. Acted as primary counsel in connection with its simultaneous acquisition and combination of two privately-held oil and gas equipment suppliers. After their integration and growth, assisted Bridge in the subsequent divestiture of majority ownership to a larger private equity firm less than two years later, generating a substantial return. Also assisted in the acquisitions of two other platform “control” investments, as well as the addition of a sizeable add-on business in 2014 for one of the platforms. Americhem Inc., a global provider of color and additive and engineered compound solutions for the polymer industry, in several acquisitions, including Infinity Compounding and LTL Color Compounding. Most recently, assisted with its acquisition of Vi-Chem Corporation, a leading compounder of specialty engineered resins used in injection molding, extrusion and blow molding applications based in Grand Rapids, Michigan, which has now created an enterprise with approximately $300 million in annual revenue.